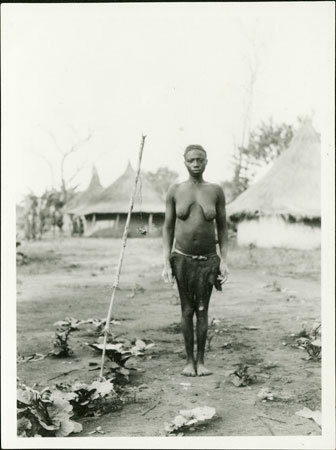 A woman standing next to a stem of a plant, which has a bundle of medicine (possibly sarawa) hanging from it by a length of string. The medicine is addressed to protect the household's garden produce from witchcraft. Morton, Chris. "Zande garden-magic" Southern Sudan Project (in development). 03 Jan. 2006. Pitt Rivers Museum. <http://southernsudan.prm.ox.ac.uk/details/1998.341.296.2/>.